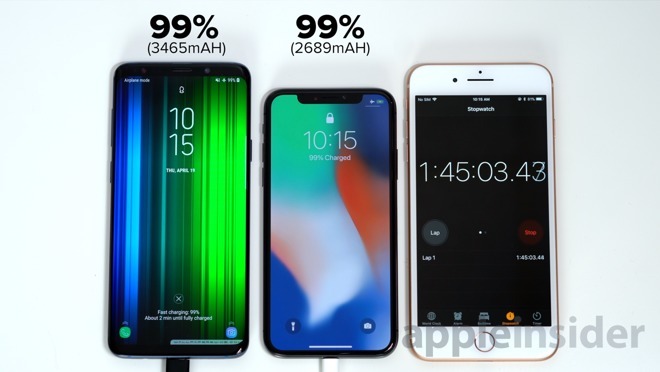 The comparison of the Apple's iPhone X's features against main rival Samsung's Galaxy S9 Plus continue with more battery tests, this time examining how long each of the premium smartphones take to recharge. 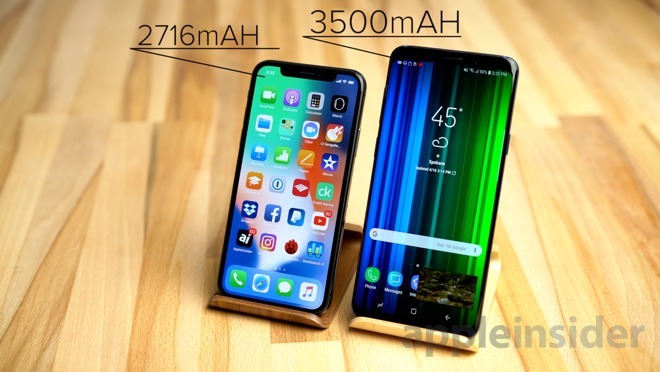 A recent battery life comparison of the iPhone X and the Galaxy S9 Plus cast Samsung's smartphone as the clear winner, but this was partly due to having a battery that's 29 percent larger than the Apple rival. While that tested how long the smartphone batteries could last while being used, it did not examine the other end of the equation, namely recharging the empty batteries. For this, we are again using the iPhone X and the Galaxy S9 Plus. The Galaxy S9's battery is similar in capacity to the iPhone X, which would in theory make for closer results, but again this is a comparison of the best smartphones that each company has to offer. It could be argued that users who care about battery life would take the larger S9 Plus over the S9, just because of the capacity difference. While the Galaxy S9 Plus has a larger battery than the iPhone X, it's missing some of the key power-related features that makes the iPhone X so attractive to buyers. Apple claims the iPhone 8 and X will charge up to 50-percent capacity within 30 minutes under perfect conditions. The downside is that achieving this requires the purchase of at least a 29-Watt USB-C MacBook power adapter and a USB-C to lightning cable. Acquiring these can be expensive, with Apple selling the two items for $74. Cheaper third-party accessories will also work, as long as they support USB Power Delivery, also known as USB PD. Be aware that there is no point in buying the 87-Watt version of the Apple power adapter. Fast Charging is limited to 18 Watts, so it doesn't matter if you use a 29-Watt, 61-Watt, or most expensive 87-Watt power adapter, as they all provide the same results when charging in this way. Samsung, on the other hand, includes their 15W fast charger right in the box, so there's no need to pay for extra accessories on top of the already pricey smartphone. Starting from empty, both phones were plugged in for charging at the same time. Shortly after, both devices were powered on, but the iPhone X didn't turn on until the third try. To minimize background battery usage, airplane mode was turned on for both devices. 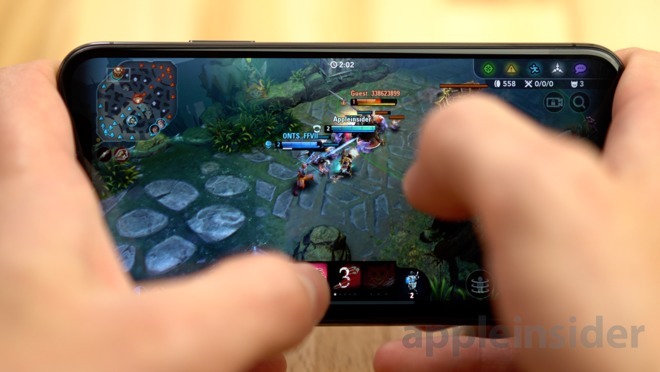 The iPhone X had a strong start, reaching 25 percent capacity after just 15 minutes, while the Galaxy S9 Plus lagged behind at 18 percent. At 30 minutes, the iPhone X hit 50 percent, as promised by Apple, and the S9 Plus was at 35 percent. 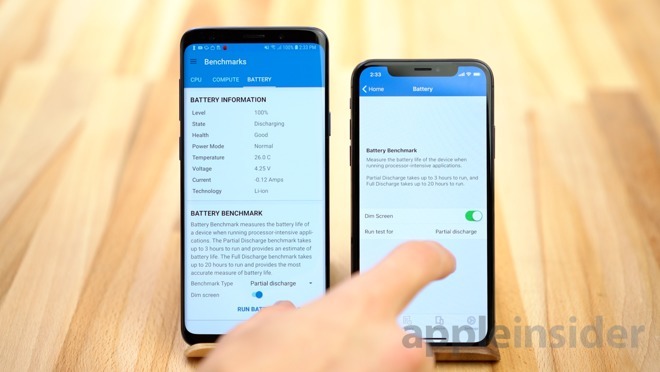 Another 15 minutes later, the iPhone X charged to 72 percent, whereas the Samsung was still around 20 percent behind. After a full hour of charging, the iPhone X had reached 80 percent, climbing by only 8 percent in the previous 15 minutes. The lagging S9 Plus seemed to start catching up, closing the gap to just 9 percent. 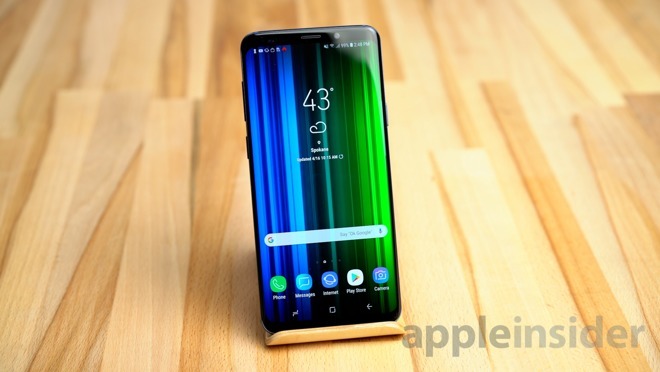 At 1 Hour 15 minutes, Samsung's device had almost caught up to the iPhone X's 89 percent, with the Galaxy S9 appearing to charge at a consistent pace. An hour and a half in, the iPhone X reached 96 percent. Though the Galaxy S9 was right behind, it only gained 7 percent since the last checkpoint, losing its charging consistency. Another 15 more minutes later, both devices are at 99%. It seems like the iPhone X's charging speed started to increasingly slow down after the 50% mark, whereas the S9 Plus slowed down after the 80 or 85% mark, but not as slow as the iPhone X. At exactly 1 hour, 45 minutes, and 52 seconds, the S9 Plus showed it had reached its capacity, but the charging indicator LED didn't switch to green until around 4 minutes later. At the same time as Samsung reached 100 percent, the iPhone showed it was still at 99 percent, and stayed at that level for quite a while. It wasn't until 1 hour and 54 minutes into the experiment that it finally reached 100%. We are really impressed with the charging ability of the Galaxy S9 Plus, since it charged a battery that is 29% larger than the iPhone X in less time, even though it only supports 15-Watt fast charging. The slower charging speed of the iPhone X when it gets close to being fully charged happens because of how lithium-ion battery charging works from a software perspective. 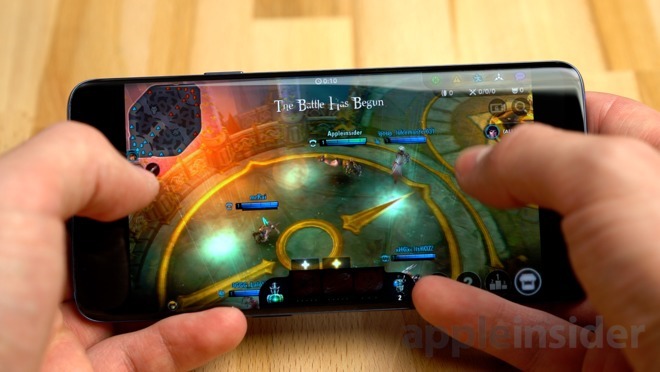 The charging rate is cut back for heat and safety reasons, and the differences between the iPhone X and the Galaxy S9 appear to be just in the percent display, as both devices have good charging logic to prevent runaway thermal conditions, which can result in battery damage - or worse. The difference in percentage reporting was also apparent when we tested standby time. The iPhone X claimed it had dropped its battery capacity by just 1 percent over a 16-hour period. There is certainly a possibility that one phone or the other incorrectly displays the true battery percentage when near a full charge, or drops quicker than any so-called "normal rate" when nearing empty, but there isn't nearly enough evidence to make that claim.